The Cooper family may have been responsible for creating a breakthrough for the nimble rear-engined F1 chassis, they certainly didn't produce the first rear-engined machines to grace an F1 grid. That honour was claimed by Ernst Klodwig's self-built BMW special known to the world as Heck-BMW - a rather obvious name, 'Heck' meaning 'rear' in German. Apart from its odd engine mounting, pioneered by Auto Union before the war, Klodwig's outlandish machine was symptomatic for the peculiar entry policy by the organizers of the old-style German GP on the original Nordschleife. In the sixties, a concurrent F2 event was held alongside the F1 race, while the early years of the F1 World Championship - then effectively run to F2 regulations - saw the Germans enter a host of home-made Veritas sportscars, BMW-powered AFMs (for Alex von Falkenhausen Motorenbau) and BMW specials solely for their home race, as they were still excluded from international competition. East German BMW copycats EMW (for Eisenacher Motoren Werke, later the factory to produce the Wartburg cars) also entered the 1953 race with the legendary Edgar Barth and an engine from Munich. Entry numbers starting at No.71 (1951) or No.101 (1952) were another typical feature of the first couple German GPs counting towards the Championship - a habit taken over from the early post-war East and West German F2 championships. Together with his countryman Barth, East-Berliner Klodwig remains one of few drivers from behind the Iron Curtain to start an F1 Grand Prix. With Barth's IFA Kollektiv EMW and Klodwig's BSG Motor Heck-BMW, an enormous fleet of Teutonic homebrews from both the Eastern and Western allied zones took part in the 1952 and 1953 German GPs without turning up in the rest of the Championship races. The German GPs run to F2 regulations attracted many wildcard entries, the home-grown two-litre BMW 328 6-cylinder complying with the rules for maximum engine capacity. In 1952 we had Herrn Riess, Helfrich, Brudes and Peters running their private Veritas-BMW RennSport cars, with the better known Paul Pietsch, Toni Ulmen and Hans Klenk driving Veritas Meteors. The AFM phalanx was formed by Willi Heeks, Helmut Niedermayr and Willi Krakau, while Marcel Balsa, 'Bernhard Nacke', Harry Merkel, Rudolf Krause and Ernst Klodwig all entered BMW specials, or 'Eigenbau' (which reads 'self-built' in English). For 1953, the local touch was provided by another armada of Veritases, Seidel, Heeks, Helfrich, Ernst Loof, Oswald Karch, Erwin Bauer and Hans Herrmann all taking part. Theo Fitzau and Hans-Günther Bechem (a.k.a. 'Bernhard Nacke') formed the AFM line-up, while the elder Stuck drove a Bristol-engined AFM. Again Klodwig turned up with his rear-engined BMW special, with Krause renewing his German GP entry with his Dora Greifzu-entered Eigenbau. Generally, Klodwig's and Krause's specials (both the Greifzu and the Reif example, also from East German heritage) are seen to be sufficiently self-designed vehicles for their creators to be recognized as separate constructors. Most BMW specials were based on the pre-war BMW 328 sportscar and from 1948 on these cars formed the bulk of national F2 racing, an enthusiast category where 328 derivatives enjoyed virtual monopoly. Sadly, no-one has kept an accurate account of the history of those early post-war days of West and East German F2, conducted under difficult circumstances, thus robbing us historians from full records of results, let alone entries and practice sessions. Of the makes we know were using BMW parts Veritas and AFM later enjoyed success outside Germany, while DDR factory EMW (also known as DAMW and AWE) made the best BMW-based cars of all, the political situation alas keeping them to race in the two Germanies and the Eastern Bloc countries. So what exactly comprised of a BMW Eigenbau? Well, they could be anything ranging from purpose-built single-seaters to stripped-down 328s. Restricting ourselves to the Specials racing in international F2 and even F1 events up until the end of 1954, we will still find that the details remain hazy. The list of those specials could be more or less: the Greifzu, the Heck, the Jicey (a French project carried out by a British agent), the Reif, the RG Special, the Monnier and the Orley Special, although this last one seems to have been a Veritas. Klodwig's Heck-BMW stood out for being rear-engined, while the Greifzu was first campaigned by well-known DDR resident Paul Greifzu, making his creation the most consistently successful East German car in 1951, up until his death in Dresden in 1952, his last win the 1952 F2 Rostock Osthafenkurs. From then on, widow Dora entered the vehicle for other Germans, but not always as a Greifzu. 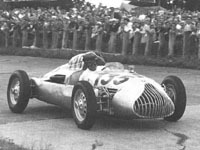 The Reif is often confused with the Greifzu as Rudi Krause is said to have driven it in the 1953 German GP. This is probably true as Dora Greifzu not only entered her own car but also the Reif-BMW on this particular occasion. Anyhow, all these cars would have touched the Nürburgring crowd with a touch of nostalgia and a tinge of melancholy, hadn't it been for the self-guided and stubborn leadership of erstwhile BMW president Kurt Donath. In Germany's darkest days, April 1945, Adolf Hitler gave Donath the infamous 'Tilly' order whereby the Munich factory was to be destroyed before the allied forces could take control. Donath ignored the Führer's order, as well as that of the conquering Americans, who laid claim to the factory's entire inventory after marching into Bavaria. Under Donath's guidance, BMW survived the tough post-war years by producing pots and pans and other kitchen appliances. Then, to everyone's amazement, in April 1951 BMW started producing cars again. With the Wirtschaftswunder of Chancellor Adenauer - the same man who before the war had promoted the construction of the 'Ring, so near to the town carrying his name - really on a roll, the factory soon rolled out the Isetta, one of Germany's three-wheeled midget cars fitting to the tight family budget of most Germans. An Isetta even took part in the 1955 Mille Miglia and fared no better than the Eigenbaus in the early-fifties German GPs. Which means poorly... But the BMWs, Veritases and AFMs still form an integral part of early post-war single-seater racing, the resourcefulness of their constructors telling a lot about German resillience in an age still battered by the war.